This post will provide a basic overview of venture capitalists’ (VCs) role in the biotech ecosystem and society as a whole (to read more about how venture capital firms work, read this post). This is aimed not only at those who are considering starting a company, working for a startup, or who are interested in VC, but anyone interested in understanding where our medicines come from (VCs are responsible for selecting many of the medicines that are introduced to the world), or anyone working in academic science (as VC funding for early stage science is increasing while NIH funding is declining). First, a basic definition of VC: a venture capitalist is a professional investor who gets paid to invest other people’s money in emerging companies (typically companies with innovative technology) with high growth potential. While the world would certainly be better off if more non-profit money funded drugs through approval, in reality the only groups with the capital, networks, expertise and risk tolerance to develop medicines are VCs and biopharma companies. In 2017, 92% of approved drugs were owned by publicly traded companies (the rest were owned by private companies, with one owned by a non-profit / for-profit joint venture). If VCs didn’t fund translational research, it isn't clear that anyone else would. In recent years, VC-funded companies have developed breakthrough medicines that greatly improve the lives of many patients. In fact, VC-backed startups developed more newly approved drugs in 2017 than big pharma (39% were developed by "big pharma", 43% by venture-backed companies, and the remainder by mid-sized companies). While the world is certainly better off for having these medicines, not everyone can access them, and there are many diseases where no new medicines are being developed. Venture philanthropy and disease foundations are starting to fill a much-need void here, but foundation funding is dwarfed by VC funding. 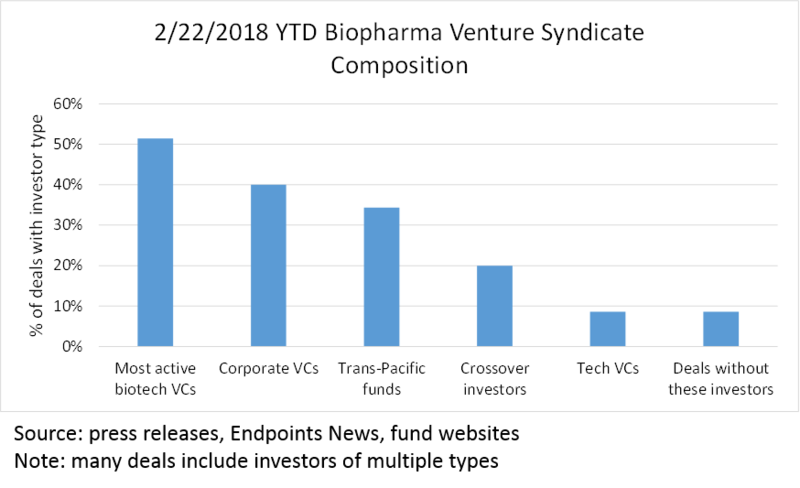 In biopharma, venture capitalists accomplish their job of generating financial returns by investing in science-based companies developing drugs to treat diseases with high unmet need. VCs typically fund science that is later-stage than the research funded by government, but still too risky and early-stage for a big pharma company. This stage is commonly called the “valley of death”. As a reminder, you cannot sell a pharmaceutical product without FDA approval. So research stage companies can’t simply generate revenue to fund development. They need outside capital. 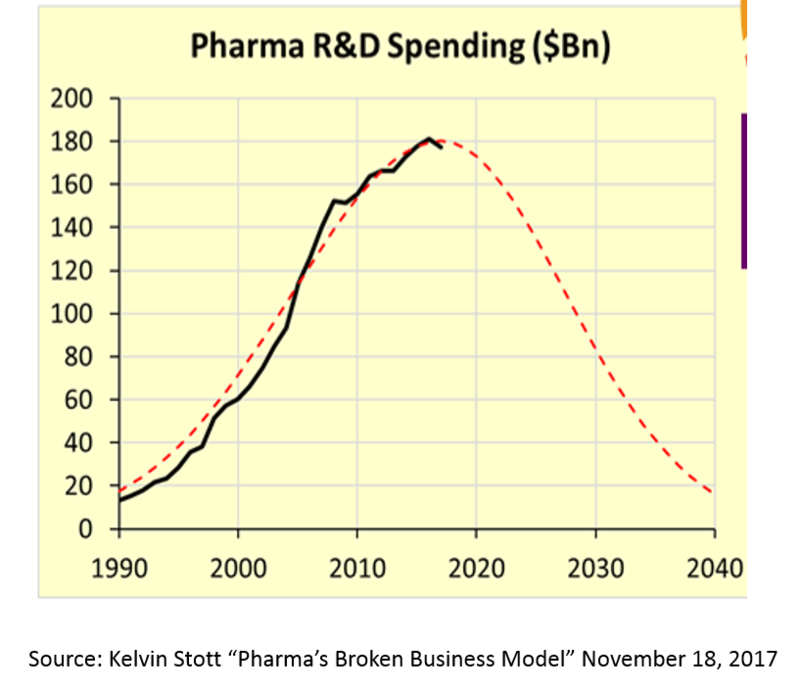 Big pharma companies are major funders of large Phase 3 studies, as these requires significant amounts of capital. 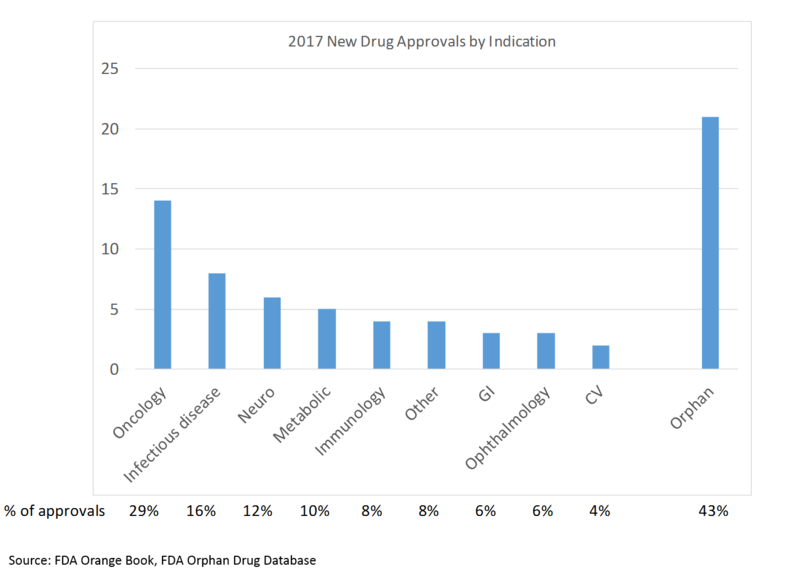 Over 90% of the new drugs approved in 2017 were owned by public companies at the time of FDA approval -- this makes sense considering the large sums required for clinical development and the fact that public companies tend to be large and well-capitalized. These later-stage studies are lower risk, but more expensive. Once a drug successfully completes a Phase 2 study, it has almost a 65% chance of getting approved by FDA. However, a drug entering the target-to-hit stage has only a 4% chance of getting approved. The chances are even lower at earlier stages. For some reason, VCs seem to do a much better job of capital allocation at these early, risky stages. 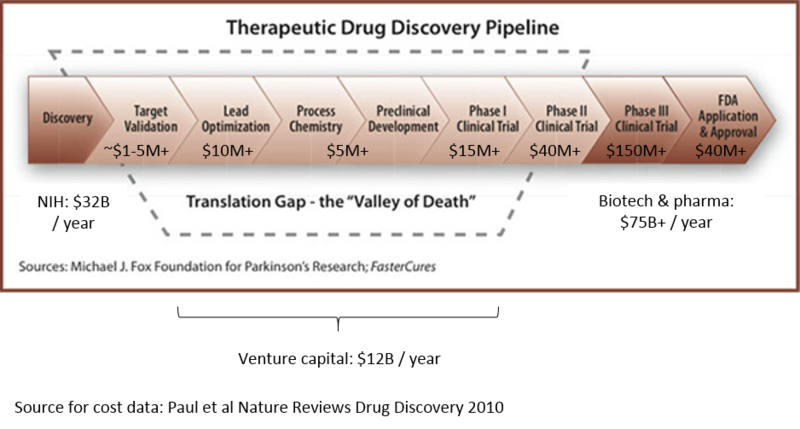 Big pharma also invests in the earliest stages of discovery (based on public filings, many big pharma companies spend roughly similar amounts on late stage clinical development and early stage R&D). However, comparatively few new approved drugs are discovered by big pharma -- they typically buy these drugs after a startup has de-risked them. In 2017, about 39% of newly approved drugs were discovered and developed by big pharma companies, and 43% were discovered by startups. The remainder were largely developed by mid-size biotech companies. So "big pharma" (defined for our purposes as the top 15 biopharma companies by revenue) spends $75B / year on R&D, and VCs invest ~$10B / year into R&D-focused startups. Yet VC-backed companies develop more FDA-approved drugs, at least in 2017. Part of this can be explained by the fact that much of big pharma's R&D spend goes to later stage clinical studies rather than early-stage R&D. However, even if we assume half of big pharma R&D goes to Phase 2 and 3 work, they still spend almost $40B on early-stage R&D: four times as much as VC-funded R&D. Why is this? I don't really know. Big pharma has the most talented scientists and managers in the industry -- most startup CEOs actually come from big pharma. They have the most resources, access to influential academic scientists, cutting edge technology, big lobbying budgets -- seemingly every advantage possible. But their return on capital invested in R&D is woefully lower than that of VC's. I may write a post on this in the future, but for now my best guess is that bureaucracy, politics, processes and risk-aversion in big companies create a culture where innovation isn't truly valued. As mentioned above, most of our approved medicines are owned by for-profit companies at the time of approval, and most are developed by for-profit entities. In 2017, out of 49 new drugs approved (this only includes novel drugs, not generics or reformulations), 92% of the drugs were owned by public companies at the time of approval, 39% were developed in-house by big-pharma companies, 43% were developed by venture-backed startups, and most of the rest were developed by mid-sized biotechs. VCs invest in drugs that they think will be profitable. Once a VC-backed company takes a drug through the riskiest part of clinical development, generally a big pharma company buys the drug and takes it to market. Big pharma companies are not great at risky R&D, but they are really good at conducting the expensive human studies that make up the final stages of getting drugs approved, and they are also very good at commercializing drugs. What kind of drugs do big pharma companies buy? We see that there is significant overlap between the companies that VCs fund and the products that big pharma acquires. Big pharma companies generally want advanced drug candidates, and the only drugs that get to this advanced stage are those funded by venture capital. VCs don’t unilaterally decide which drugs to develop; they try to fund the kinds of drugs that big pharma wants 1. If it's true that most new drugs come from big pharma companies, and that most big pharma products come from VC-backed startups, what diseases do you think most new drugs are designed to treat? 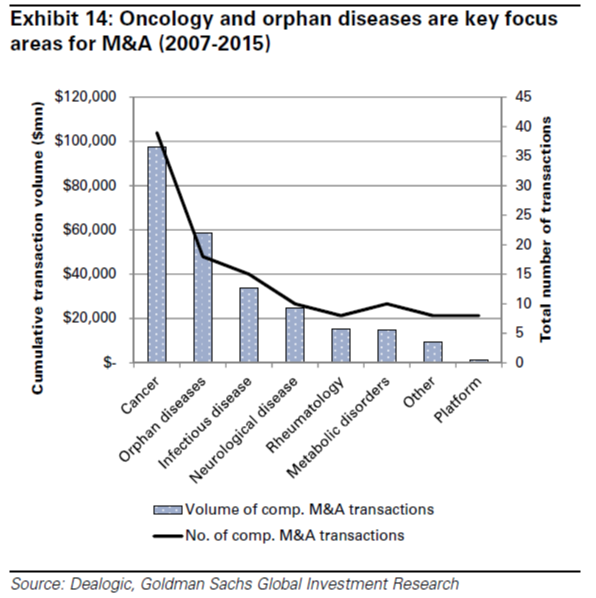 So VCs and pharma seem to like cancer drugs and drugs for rare (“orphan”) diseases, with drugs for infectious disease and neurological conditions a bit behind those two groups. It turns out that the types of medicines that get FDA approval are in those same categories. But are we developing the right drugs for society? How good are venture funds and pharma companies at treating the most pressing illnesses for our society 2? The answer is that the drugs we develop are not necessarily aligned with the greatest societal need, at least as measured by number of deaths (although cancer certainly appears in both groups). In fact, the drugs we develop can be causative of suffering in some cases: the 4th leading cause of death, “unintentional injuries”, includes deaths from heroin and opioid overdose (as well as from motor vehicle accidents, falls and other causes) 3. 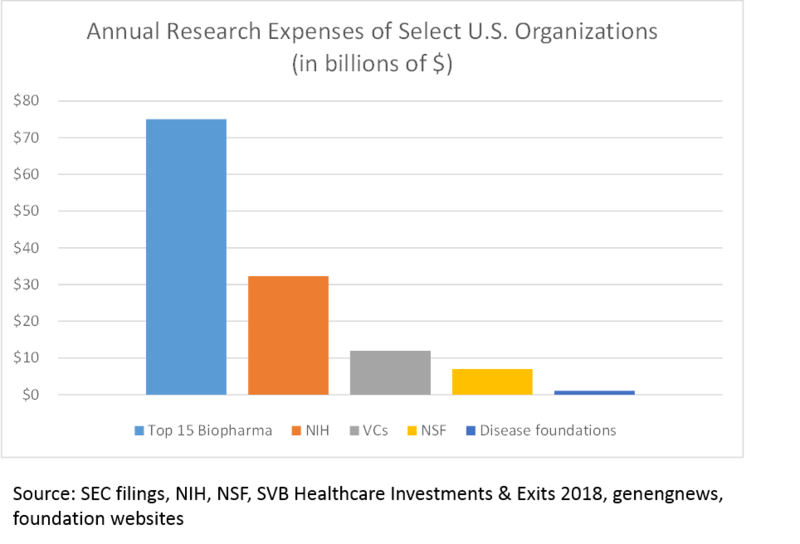 Stepping back: it’s reasonable to ask whether VC funding simply reflects NIH’s funding priorities. After all, most VC-funded science is based directly or indirectly on government-funded research, so perhaps NIH ultimately determines what medicines get developed through its funding decisions, and VCs and pharma follow along. This does not seem to be the case. 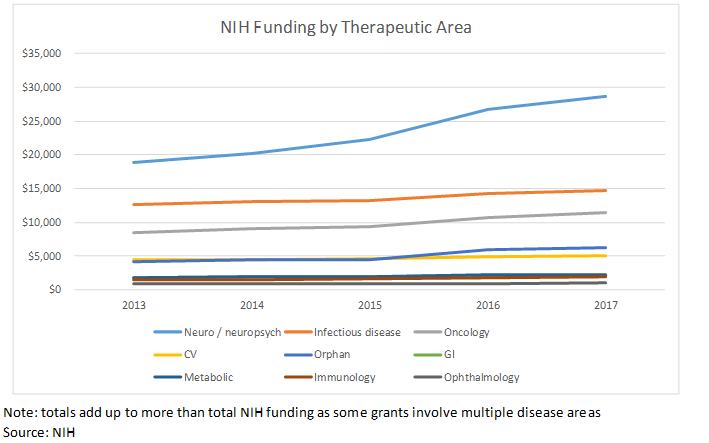 Neuro / neuropsych receives far more NIH funding relative to VC funding, pharma money and FDA approvals, while rare disease and cancer receive comparatively less NIH funding. 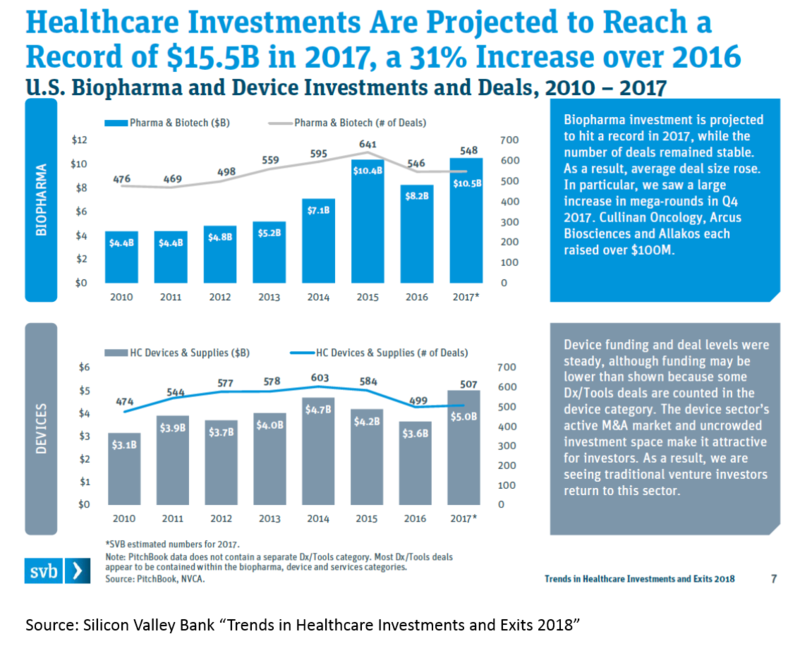 With all of the obvious caveats associated with this type of back-of-the-napkin analysis, it certainly seems like VC funding decisions are more predictive of what medicines get to patients than NIH funding. Especially given the current public discourse around drug pricing, it is easy to be uncomfortable with the fact that profit-driven investors largely determine what medicines become available to patients. While venture funds and pharma companies are far from beyond reproach, they do play an important role in society: if VCs and big pharma disappeared tomorrow, the drugs they develop would also disappear. There does not seem to be any group in the world capable of replacing venture capital and the biopharma industry as the developers of the medicines of the future. In addition to their role in determining what kinds of medicines are brought to market, VCs are increasingly replacing government funding and big pharma R&D dollars as the main funders of scientific research, especially in California (and maybe in Massachusetts, but I haven’t done that analysis). 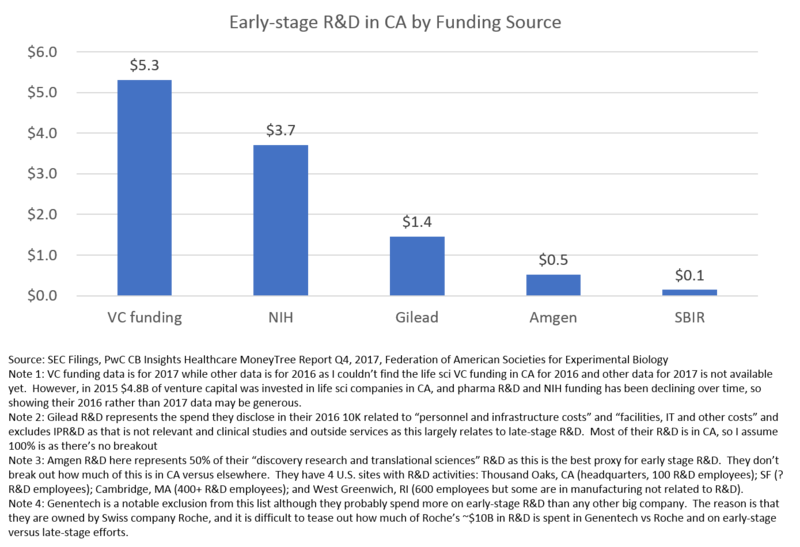 Subject to all of the fine print in the caption, in California, venture capital funds more innovation than the NIH and much of big biopharma (information on big pharma early-stage R&D spend in CA is hard to find, so this should be viewed as illustrative and by no means conclusive). 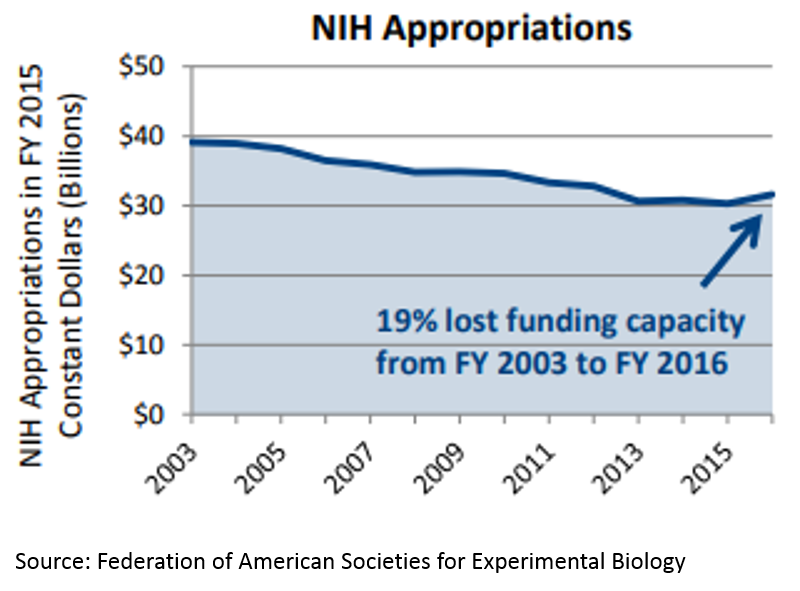 There has been a steady decrease in NIH funding over time. NIH is a government agency and is responsible for funding much of the basic science research that occurs at academic institutions. Global biopharma R&D (including companies of all sizes) still funds the vast amount of R&D. However, this spend has been slowing, and is expected to continue to slow (the decline projected in the chart is perhaps pessimistic, and the trendline is not meant to be statistically valid, but read the full post to understand the author's position). It is important to note that most of this R&D is related to late-stage human studies or studies of already approved products, rather than early-stage research. 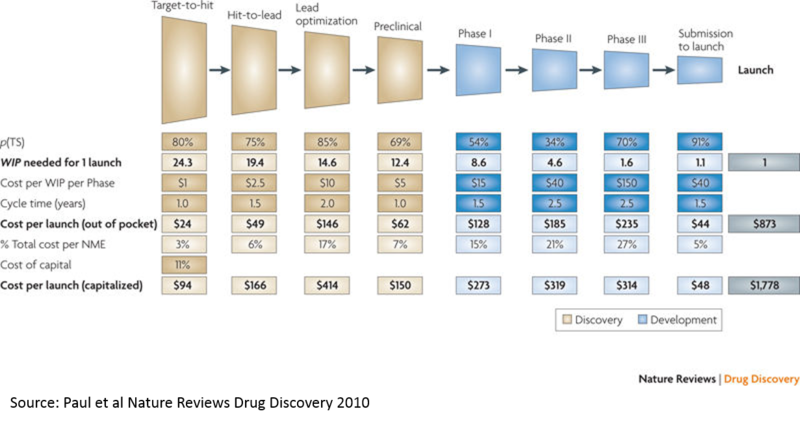 For both Amgen and Gilead, late-stage R&D made up over half of all R&D. 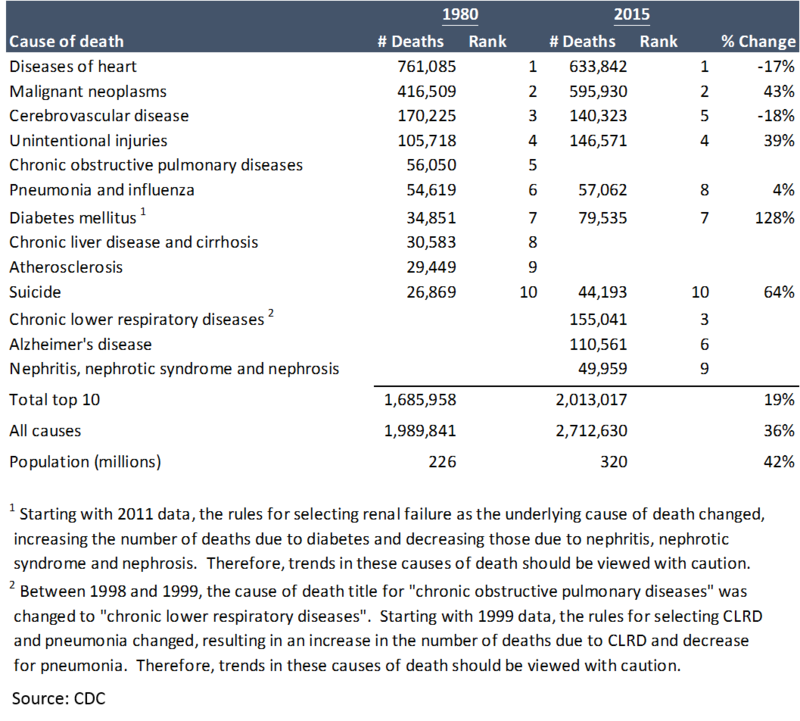 There is clearly room for improvement here, as many important diseases go without new medicines. However, developing new drugs is a very challenging, risky and expensive task, and in recent years investments into novel drugs have led to breakthroughs in cancer therapy, treatments for rare disease, and many other conditions. The second part of this series (how VCs work) is here. 1 A quick note on what makes a drug likely to be profitable, although this is a complex topic for another post: as a general rule, the most profitable drugs are those that offer the most clinical benefit to patients. The better a drug is at improving human life, the more financial rewards it will accrue to its developer. Doctors only prescribe drugs that work (unless they have no other options), and insurance companies only pay premiums for drugs that provide a unique clinical benefit (again, reality is more nuanced, but that’s another topic). That is why oncology drugs (where drugs can significantly extend lifespan) and drugs for rare diseases (that can be devastating and which usually don’t have many good treatment options) are invested in more often than something like high blood pressure (where we already have drugs that work pretty well). 2 This comment is limited to the United States, as that is where I live and work and where the most data is available to me. For what it’s worth, pharma and VC are certainly not that good at developing medicines for developing countries, as it is very hard to do so profitably. Unfortunately there are not enough people working on solving this problem, although the Bill and Melinda Gates Foundation and others are leading the way in this important work. 3 The reasons for this are complex and beyond the scope of this blog, but generally boil down to whether they are profitable to develop. The diseases where there isn’t a lot of venture funding typically require high cost (large trials required by FDA in the case of diabetes / metabolic and cardiovascular disease), low profit potential (existing generic drugs that already work pretty well like statins, ACE inhibitors, many antibacterials, etc.). A recent article addresses this in more detail.